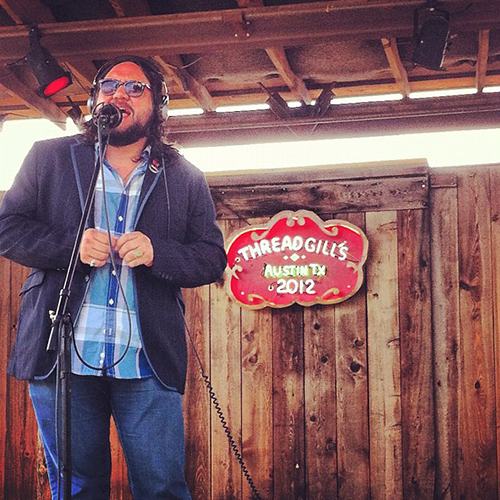 Visitors and locals alike may know Threadgill&apos;s for its Southern cooking and regular live music, but most people don&apos;t know the story behind Threadgill&apos;s.
Local artist, Nakia, at Threadgill&apos;s World Headquarters. In 1933, musician Kenneth Threadgill moved back to Austin and began working at a service station on North Lamar Boulevard. Later that year, Threadgill bought the establishment and changed it to Threadgill&apos;s Tavern, which still sold gas and food but operated with the first beer license in Austin after the repeal of Prohibition. His place soon became a favorite for traveling musicians of all genres. Over the years, many up-and-coming musicians, including Kris Kristofferson and Janis Joplin were regulars. After nearly being demolished, the original Threadgill&apos;s site was saved and then purchased by Eddie Wilson, owner of the famous music hall, Armadillo World Headquarters. Wilson made Threadgill&apos;s a Southern style restaurant in 1981, based on the success of the menu at the Armadillo. In 1996, Threadgill&apos;s World Headquarters was opened in south Austin, right next to the old site of the Armadillo Headquarters. Now both the North and the South locations serve Southern home cooking, host regular live music and events and display some fantastic old Austin memorabilia. My favorite dish is the chicken fried steak platter with mashed potatoes and fried okra. Another great option is their veggie plate, which is a total bargain! Do you have memories of Threadgill&apos;s? Tell us!